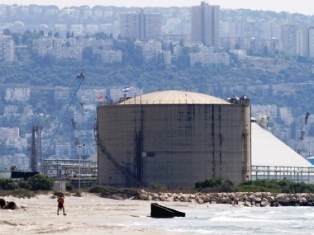 On October 6, 2013, the Israeli Government decided to scrap the Haifa Chemicals Ammonia Tank near Haifa, and instead to build a new tank and probably also an ammonia production plant near the Negev Nuclear Research Center in Dimona. The laconic announcement stated also that this will happen until 2017. Yet, the importance of the step was signaled by its being promoted directly by the Prime Minister Bureau together with the Ministry of Environmental Protection. This is a quite unusual level of involvement for deciding the location of a single tank of chemicals. Moreover, the project was defined as having “National Importance and Urgency.” This is intriguing, considering the fact that the tank is relatively new. Its creation was decided in 1986, and it could function for many more years. Somebody in the government got scared. In an ironic touch, the announcement was published on the same day the UN started the destruction of Syria’s chemical weapons. Most visitors passing through Haifa probably would recognize the image above. Just behind the tank, the compact Port of Haifa can be seen; its expansion was recently decided.1 The tank is next to the Chemicals Pier. Everybody traveling from Haifa northwards passes the road next to the port. The isolated, large tank is the most unsettling sight in the area. Even if one doesn’t know what is kept inside, the obvious effort to keep its content inside at all costs is enough to scare passersby. Ammonia is classified as toxic and hazardous. If consumed in small quantities it is harmless, but since it is highly caustic its inhalation or consumption in large quantities is a real danger. Moreover, it easily reacts with many molecules, primarily if heated in an explosion, creating derivate poisons. Of concern are its reactions with halogens, which are also present in the port area. In gas form, ammonia is flammable and can create explosive compounds. In other words, Israel placed a large chemical weapon of mass destruction near one of its main cities and industrial areas. Yet, ammonia is a key component in the fertilizers industry, and thus it is vital for Haifa Chemicals together with phosphates brought from Mishor Rotem, near Dimona. The operation is simple. Once a month, a ship arrives at the port and sends 12,000 metric tons of ammonia through a dedicated tube directly into the tank. Due to the sensitivity of the operation, its timing is never disclosed. Israel is a chemical trap. On July 14, 1997, four Australian sportsmen were killed and over sixty were injured after they fell into the Yarkon River after a small bridge collapsed during the Maccabiah inauguration ceremony. The waters weren’t deep, and flowed slower than a man walks. They were killed due to the poisoned waters. The Kishon River waters pass next to the Haifa industrial zone, one of the largest and most polluting in the country. Until several years ago, the river served as training waters for Shayetet 13, the IDF naval commando. Many of its soldiers contracted cancer. 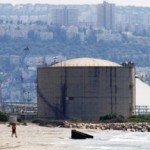 Recently, Israel admitted cancer cases caused by its criminal practices in its nuclear reactors. Israel owns an impressive amount of chemical industries. The largest dangers are concentrated in two zones, both of them densely populated: Haifa and Beer Sheva. Haifa is home to the Oil Refineries, the Gadot Chemical Port and various industries. The docks of Gadot hold large quantities of highly reactive chemicals at all times, especially for the plastic and agrochemical industries. Its location implies the whole of the Haifa Bay could be contaminated if the containers were harmed to the extent of stopping the port activities completely, or at least limiting them seriously. 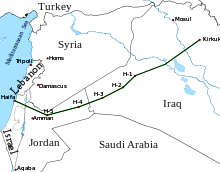 During the days of the British Mandate on Palestine, there was an oil pipe from Iraq to Haifa, marked in old maps with an “H.” It still exists and is strategically important, though it is inactive since it provides large landing areas, mainly around a point known as H2, this is the chosen area for opening a second IDF frontline against a ground attack by means of a vertical bypass. The Haifa refineries at its end are very active. What is the economic point of importing crude oil and distilling it for local consumption? That is not the point; the financial side seldom is the key when dealing with Israel. Oil refineries use mono- di- and tri- ethanol amines in the oil purification process. Triethanolamine—usually known as TEA—is a precursor of chemical weapons and is smuggled out from the refineries to other industrial locations. Related to the oil industry are vast subterranean reservoirs of military and civilian grade gasoline. If spilled they could contaminate the limited water subterranean wells under the West Bank. Access to these waters is one of the main reasons for Israel’s holding empty mountainous areas along the Samarian mounts. The extensive use of these waters in recent years caused a serious lowering of their levels, transforming the surrounding ground (i.e. central Israel) into a thirsty sponge readily absorbing any liquids, and thus increasing the rate of the contamination process in the case of a spill. Chemical industries in Beer Sheva include mainly those related to by-products of salts extracted from the Dead Sea by the Dead Sea Works, formerly known as the Palestine Potash Company. The salts are used for the production of agrochemical products and for the bromine related industries, mainly for the production of fire retardants. Most synthetic carpets in the world use fire-retardants produced here. The extraction of the salts is done on the southern side of the Dead Sea, where all the evaporation pools can be seen, but its chemical processing is done in several plants in the outskirts of Beer Sheva. There, two corporations do the processing: Makhteshim-Agan for the agrochemical products and ICL (Israel Chemical) for the bromine industry. Even those knowing very little chemistry know bromine is highly reactive and poisonous; the same goes for fertilizers, herbicides and pesticides. That means unusual quantities of pollutants are produced and stored next to the city. Yet, the danger is unexpectedly large since the Makhteshim plant produces methyl isocyanate. This extremely toxic substance is used in the production of pesticides. It became famous during the night of December 3, 1984, when it was spilled in the Bhopal installations of a company now owned by Dow Chemical. Defined as the worst industrial disaster in history, it caused the death of thousands, many more were crippled, and the ground is still contaminated. Dow Chemical learned nothing; it is a major provider of Oil Refineries, Makhteshim, Agan, ICL and others.2 At all times, there are hundreds of kilograms of this substance waiting further processing at Makhteshim. Israel has the potential of becoming the scene of the worst industrial disaster, overtaking Bhopal by several orders of magnitude. Already in 2006, Hezbollah hit the Haifa Port area from Lebanon. Yet, Israel did nothing. “Ammonia? Bromine? Are they nuclear weapons?,” the Prime Minister asked rhetorically, “Don’t bother me if not!” he summarized the threat. In 2013, Prime Minister Netanyahu’s attempt to incriminate Syria in the use of chemical weapons failed.3 Yet, it showed him how devastating such an attack can be and how easy is to mimic it. Nobody needs to attack Israel with chemical weapons. Israel is a chemical weapon; hit it with a conventional missile in the right spot and the Bhopal disaster will look benevolent. Slower than snail-mail in Antarctica, the message was understood by Netanyahu. The decision taken is more complex than it looks. Though the exact details of the new plant were not revealed, they will be in the vicinity of the phosphates excavation site in Mishor Rotem, a few minutes from Dimona’s Negev Nuclear Research Center. Why? The ammonia will enjoy there the aerial defenses of Israel’s nuclear weapons plan. All of the sudden, at the end of a long and hot summer, Netanyahu got cold feet. On May 5, 2013, Carla Del Ponte, member of the United Nations Independent Commission of Inquiry on Syria declared that the commission’s investigators have gathered testimony from casualties of Syria’s civil war and medical workers indicating that rebel forces have used the nerve agent sarin. These mercenary forces have been supported by Israel and the West. The American attempt to recycle the Weapons of Mass Destruction lie that led to the American attack on Iraq in 2003 had little chance to succeed. The mercenary’s chemical attack was well documented; it didn’t make sense that al-Assad would use chemical weapons while winning. “Failure awaits America as it has happened in all its wars from Vietnam onwards.” He is mistaken. The USA utterly defeated Grenada. The claims on the use of chemical weapons by the Syrian Government were defined by Assad as “an insult to the intelligence. It is nonsense. First, they put you on trial and only after they collect evidence…. On Wednesday, we were blamed, and only two days later the USA announced it would start to collect evidence.” This is not the first time that the American Government displays a misunderstanding of the term “evidence” (Iran Shows Captured Drone; USA Claims “No Evidence”). Roi Tov is the pen name of an Israeli dissident who converted to Christianity and wrote The Cross of Bethlehem. Read other articles by Roi, or visit Roi's website. This article was posted on Monday, October 7th, 2013 at 8:00am and is filed under Israel/Palestine, Oil, Gas, Coal, Pipelines, Weaponry.